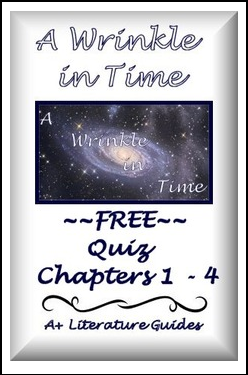 This is a free 25 question multiple choice quiz for chapters 1 - 4 of A Wrinkle in Time by Madeleine L'Engle that is common core aligned. The multiple choice format allows quick and easy grading time for teachers. --Open-ended Response Writing Activity and Rubrics . A+ Literature Guides are made by a language arts teacher with 28 years of experience teaching language arts, as well as 12 years of experience writing state and national assessments that align with common core standards.